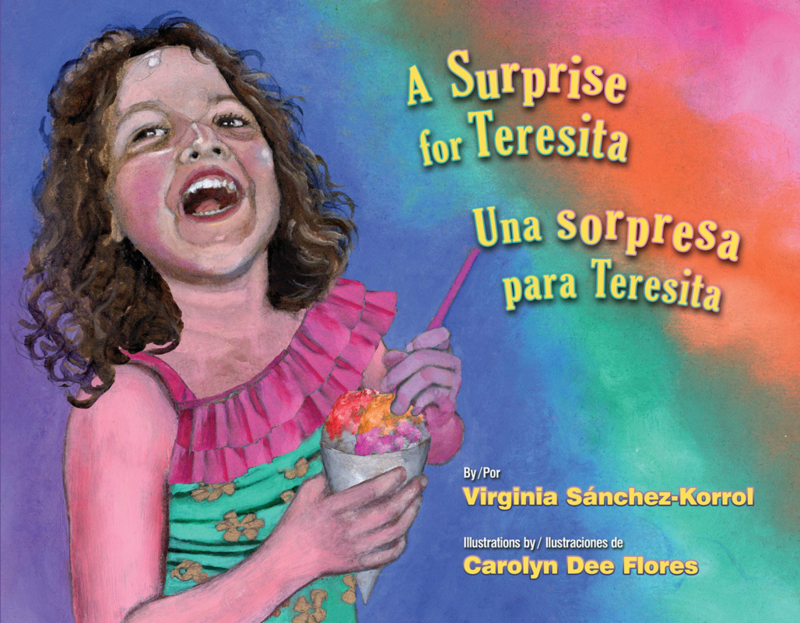 ​A Surprise for Teresita / Una sorpresa para Teresita is a colorful and heartwarming bilingual children’s book where the author, Virginia Sánchez-Korrol, reminds us that there is nothing like the genuine excitement and happiness of a child. Likewise, the charming and vibrant images by the illustrator Carolyn Dee Flores add a stroke of authentic cheerfulness throughout the story. Teresita, a little girl who just turned 7, is extremely excited to know that her uncle Ramón will be bringing her a special birthday present when he comes from work. What time will he be home? What present will he have? Teresita finds herself playing outside with her neighborhood friends while she anxiously waits for her uncle. A Surprise for Teresita / Una sorpresa para Teresita is a story that teaches us to appreciate those small yet special family moments that last a lifetime, while fostering the necessary language skills for our children in today’s beautiful and undoubtedly bilingual America. Virginia Sánchez-Korrol is a professor emerita at Brooklyn College of the City University of New York. Sánchez-Korrol writes a blog about Puerto Ricans and Latinas in the United States for The Huffington Post. Carolyn Dee Flores is a children’s illustrator and a member of the Society of Children’s Book Writers and Illustrators. A Surprise for Teresita / Una sorpresa para Teresita is an Arte Público Press publication and can be purchased through Amazon. Click here to purchase.